The Blue Springs School District caught more than 40 students vaping in school this semester. BLUE SPRINGS, Mo. 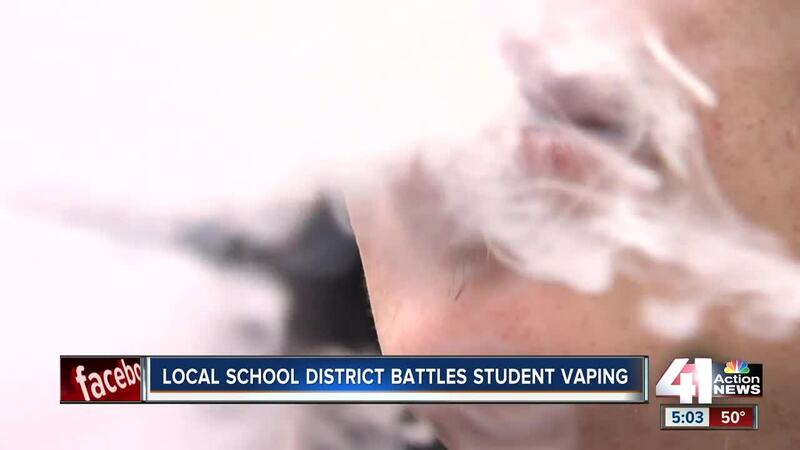 — Blue Springs School District officials say they are having a problem with students vaping and using e-cigarettes at school. Tuesday, the U.S. Surgeon General declared e-cigarette use among young people an epidemic. The Fall semester ends Wednesday for Blue Springs students and police have found dozens of students vaping or using e-cigarettes during school. "Most students are telling us that is just the tip of the iceberg of what we are catching,” said Tom Phillips, Executive Director Public Safety. Phillips' team has confiscated e-cigarette devices 40 times this semester. Blue Springs Public Safety says students are bringing the devices to school. "Looks like a thumb drive, charging them in the computer and most staff that is not familiar is not going to see anything wrong,” said Phillips. It's not just a Blue Springs problem. The National Institute on Drug Abuse says nearly two in every five 12th grade students said they vaped last year. "16, 15 years old. I mean they look like little kids,” said Exotic Kc Vape N Smoke manager Roque Munoz. Munoz says they turn around underage people daily. "There are people who do it for the original intent - to quit smoking - but everyone does it for different reasons,” said Munoz. The spike that officials are seeing in schools is growing. Phillips says the “cool” factor and the flavors attack students. The concern is, despite stores having an age policy, students are still getting their hands on the product. Students who are caught vaping or smoking in Blue Springs are sent to a vaping class. The class is done through juvenile detention services. One company that has been under the spotlight is JUUL, who sells e-cigarrettes. The company posted a statement today saying they share the same vision as the U.S. Surgeon General.